Dorothy L. Sayers was a Christian apologist and friend of several of the Oxford Inklings. 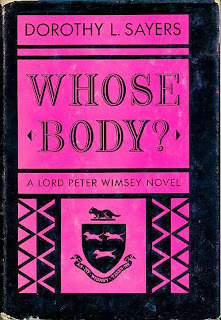 Her fame, though, was due to authoring a series of very popular novels featuring Lord Peter Wimsey, amateur detective. I first discovered the Sayers who wrote mysteries — only later the orthodox Christian apologist and playwright and friend of many of the Inklings. The mysteries featured the aristocratic amateur detective Lord Peter Wimsey, always assisted by his batman/manservant Bunter. The books are the kind you settle down in — best read, perhaps, on a long winter evening. Sometimes her variety of mystery has been called "cozy" in contrast to the more typically American "hard-boiled" thrillers. 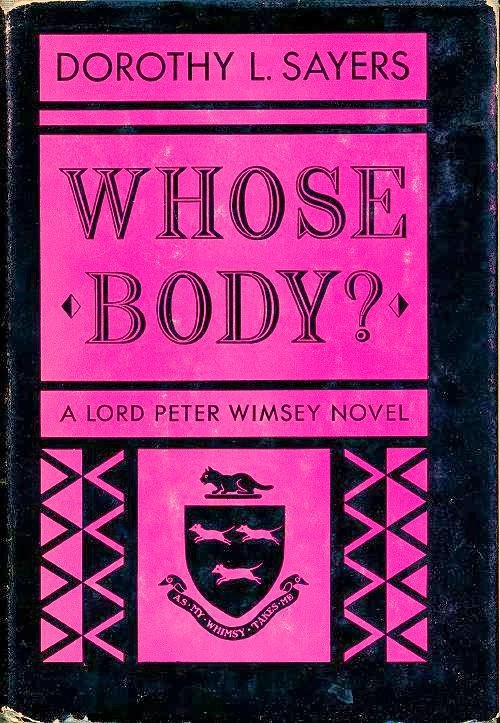 Two of Dorothy L. Sayers Lord Peter Wimsey books, although still in print, have apparently entered the public domain: Whose Body? (1923) and Clouds of Witness (1926). Both are available at ManyBooks.net, free, in several electronic formats including those used by Kindle and Nook. The fiancé of Lord Peter's sister, Lady Mary Wimsey, is found dead outside the conservatory of the family's shooting lodge in Yorkshire. Peter and Mary's elder brother, the Duke of Denver, is charged with capital murder and put on trial in the House of Lords.